What is quantum chromodynamics theory? It is startling facts that modern physics can explain quantitatively small scale phenomena of quarks and leptons ( cm) through strong and weak interactions. By M. Cardoso et al. What is quantum chromodynamics theory? It is startling facts that modern physics can explain quantitatively small scale phenomena of quarks and leptons ( cm) through strong and weak interactions. The underlying theory of the strong interactions is called Quantum Chromodynamics (QCD) and has quarks (like electrons) and gluons (like photons except they are self-interacting) as its fundamental constituents. These quarks and gluons are bound so strongly that they can never appear as free particles. This is called confinement. When probed at increasingly higher energies the interaction between the quarks and gluons becomes progressively weaker. This phenomenon is called asymptotic freedom. The theory good description of hadron properties in normal medium and also in hot and dense mediums. But, the theory has some difficulties in solving the complex system due to the number of freedom degrees such as the color charge and the number of flavors. QCD is a difficult theory to understand. Many techniques have been developed to analyze the predictions of the theory in a variety of contexts. Chiral quark models are one of many techniques that suggested to avoid some of those difficulties. The chiral quark models provide a good description of hadron properties at low and high temperature. There are Chiral-quark models such the NJL model, Skyrme model, the bag model, and the quark sigma model. These models satisfy the properties of quantum chromodynamics theory as the confinement property, asymptotic freedom, and hidden chiral symmetry. We concentrate on the one model is called quark sigma model. This model gives acceptable description of hadron properties at low energy but some results conflict with experimental data. Therefore, the researchers attempt to improve this model by including vector meson or by changing the potential mesonic interactions. On the other hand, Recently, the sigma quark model plays an important role in hot and dense mediums by including the Polyakov loop to give deconfinment property. Additionally, by including higher-order of mesonic interactions that play an important role in comparison with lattice QCD. 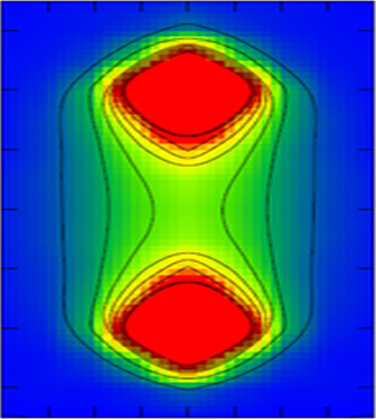 We know that lattice QCD is given good technique for solving the system of field equations at low and high energies at zero density. Unfortunately, the lattice has difficulty in describing the hadron properties and phase transition in a dense medium. Therefore, the chiral quark models are one of the successful methods in the hot medium.